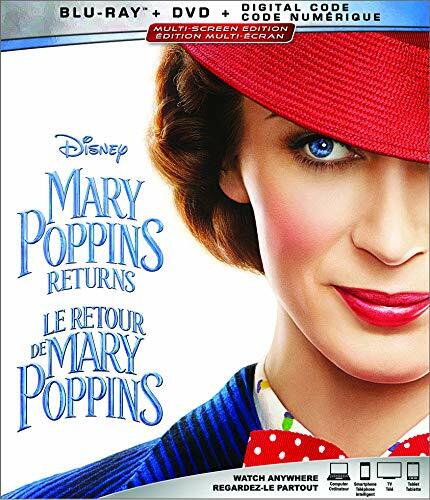 Set in London, England during the Great Slump, the legendary Mary Poppins (Emily Blunt) returns decades later to help the Banks family once again. After an adult Michael Banks (Ben Whishaw) loses his wife, he is left to look after their three children on his own. The Banks family is falling apart and are at risk of having their lovely home repossessed. Michael's selfless sister Jane (Emily Mortimer) steps in, but it is not enough. They need the magic of the practically perfect nanny, Mary Poppins, to get them through this mess, and lift their spirits. Mary Poppins Returns is a comical family sequel based on the book Mary Poppins Comes Back. The film is filled with catchy musical numbers and great tributes to the original film. This movie was nominated for four Oscars including Original Score, Original Song for "The Place Where Lost Things Go," Costume Design, and Production Design. British actress Emily Blunt takes on the coveted role of the umbrella-flying Mary Poppins in the sequel released 54 years after the original, the role brought to life by Julie Andrews. Blunt had big shoes to fill, and she delivered an ageless Mary Poppins -- she even had the seal of approval from Julie Andrews herself. One of my favorite scenes was when Mary and the children traveled into the china bowl. The whole scene is animated -- from the talking animals, down to the clothes the humans wear. I hadn't seen something like this in a while, in fact, it was director Rob Marshall's idea to use hand-drawn animation instead of a computer for the animated scenes. Not only was this due to his love for hand-drawn animation, but also as a way to pay homage to the original film. Over 70 animators were hired for this job. The number "Trip a Little Light Fantastic" was an unforgettable eight-minute song and dance. The choreography, which incorporated bicycles, was extraordinary, and the song was so catchy, the whole scene was a delight. The number actually took two weeks to film, and included up to 50 dancers. I was most impressed by the number of dancers who could achieve the human flag. The cast in the film was perfectly selected, from Emily Blunt to Meryl Streep as Topsy, Lin-Manuel Miranda as Jack, Ben Whishaw as Michael Banks, and Emily Mortimer as Jane Banks. The three children in the film were all so sweet and adorable. Joel Dawson, who played little Georgie, was outstanding with his mischievous yet lovable character. The sets in the film were marvelous, and the views of London were just enough to remind you where the film took place, without being too over the top. The costumes throughout the movie accurately depicted the time era of the 1930s, and were filled with vivacious colors to make the gloomy London setting pop. Costume designer Sandy Powell did a remarkable job and was nominated for an Oscar for Best Achievement in Costume Design for this film. This movie goes down in history as having one of the longest gaps between sequels, and should go down in history for also being the best long-gapped sequel. * Deleted Song: The Anthropomorphic Zoo - A musical number in which Mary Poppins and the children visit a zoo where the animals come to life. * Bloopers - A behind-the-scenes collection of goofs and fails on set. * The Practically Perfect Making of Mary Poppins Returns - Includes four different parts that takes us behind-the-scenes in the making of this film: Introduction, Underneath the Lovely London Sky, Can You Imagine That? and Nowhere to Go But Up. * Deleted Scenes - Includes a scene that shows the children leaving cousin Topsy's place as they stop and take a look back, and an extended version of the Leeries musical number. * And more! - The choice to play a sing-along version of the film, and exclusive commentary by director Rob Marshall and producer John De Luca. If you have seen Mary Poppins Returns and would like to rate/review it yourself, click here.